Oracles are an integral part of spiritual and religious rituals in Ladakh. 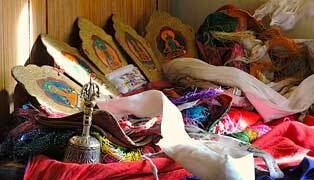 The Ladakhis believe implicitly in the influence of gods and spirits on the material world, and undertake no major enterprise without taking this influence into consideration. Not only do they perform the rites necessary to propitiate the gods - in private houses as well as in the gompa (temples); they also often take on the role of astrologers and oracles who can predict the auspicious time for starting any enterprise, whether ploughing the fields, or taking in the harvest, arranging a marriage or going on a journey- and advise as to the auspicious way of going about it. Oracles attend to several patients simultaneously to cure the ailments. Oracles usually invite spirits to take them over and the spirits that possess oracles during trance states are usually said to be either a wandering spirits or in some cases from the pantheon of Buddhist deities, which are revered as holy ones. Oracles may also treat the patient violently. The most famous monk-oracles are those of Matho Gompa. Chosen every three years by a traditional procedure, two monks spend several months in a rigorous regimen of prayer and fasting to prepare and purify themselves for their arduous role. When the time comes they are possessed by the deity, whose spirit enables them to perform feats that would be impossible to anyone in a normal state such as cutting themselves with knives, or sprinting along the gompa's topmost parapet. In this condition, they will answer questions put to them concerning individual and public welfare. There are also in some villages lay people, men and women, who have special powers as oracles and healers. Some of them belong to families in which there have been several such receptacles of spirit forces. Others are diagnosed as such without any hereditary back ground. Once they have accepted, however, they undergo a process of initiation and training by monks and senior oracles, and only after this is completed may they start practicing. The effectiveness of their spirit- healing is an article of faith with the Ladakhis.